Paul Ryan Is Running for Speaker — Can He Actually Get Anything Done? It’s looking more and more like the House leadership crisis is drawing to a close. On Thursday night, Paul Ryan officially announced that he’s heeded his party’s cries for help, and will run for speaker of the House. 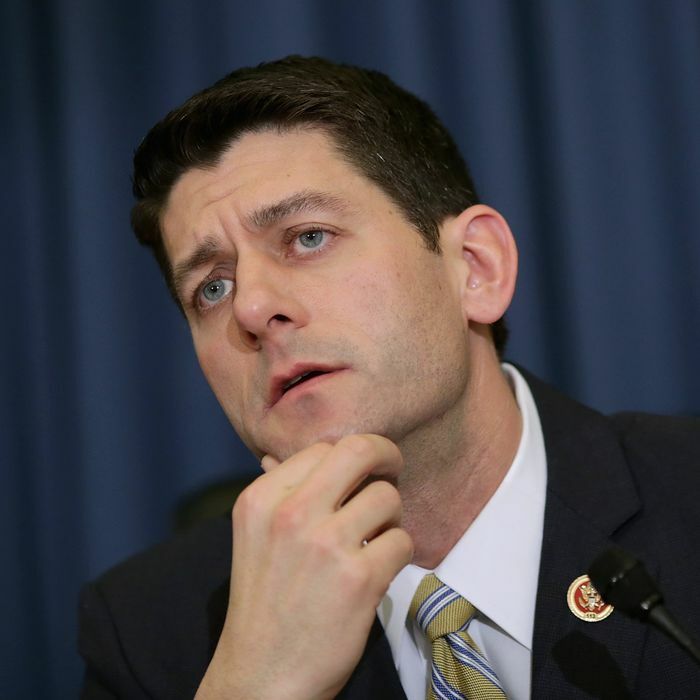 … the most important reason Paul Ryan would make a fine Speaker, is that he knows how to reach consensus. As Boehner has made clear, his biggest challenge has been managing a small faction of the party. Because Ryan has the respect of the whole Republican Party, he will be able to convert that respect into realistically managed expectations. This will be essential to enabling the Republican Party to govern again on Capitol Hill. Ryan wisely laid out conditions intended to give the speaker the ability to actually govern, but things haven’t gone quite as he planned. While Ryan has the support of enough Freedom Caucus members to win the speakership, the group did not meet his demand for an endorsement. Then on Thursday, Ryan backed off on his call for a revision of the House rule that lets members constantly threaten to stage a coup against the speaker. It’ll shrink, yes, but then it’ll migrate to other avenues of mischief. If they continued banding together, conservatives would still be able to spoil the party’s legislative agenda. This alone would damage Ryan’s longer-term political prospects, by forcing him into regular governing coalitions with Democrats. Unable to depose the speaker, they could take aim at other powerful Republicans (like, perhaps, those on the rules committee who will enable Ryan and help him advance legislation), becoming more like a third party than they already are. New opportunities for troublemaking would spring up everywhere, overlooked in the past because they weren’t necessary. The Freedom Caucus might be more receptive to a Speaker Ryan, but despite his superior consensus-building abilities, he hasn’t eliminated the problems that plagued Boehner. Congress is facing two major deadlines before the end of the year: The federal government will default if the debt ceiling isn’t raised by November 3, and the government will shut down if a new budget measure isn’t passed by December 11. As the Boston Globe notes, Ryan has yet to lay out his strategy for addressing those issues, which have divided conservative and establishment Republicans in the past. Having tested the thickness of the political ice, Paul Ryan seems convinced it will support the weight of a House speaker. Given the nature of the Republican coalition (in parts fractious, restless and heedless of political reality), he will end up in the water. But perhaps not immediately, and perhaps not until after considerable accomplishment. The most knowledgeable, thoughtful conservative in the House is now likely to lead the House, which is the sign of an institution still capable of random acts of sanity. As Speaker, Can Paul Ryan Get Anything Done?